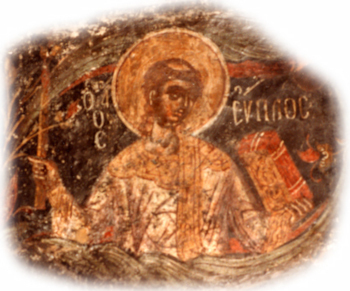 The Martyr Archdeacon Euplus suffered in the year 304 under the emperors Diocletian (284-305) and Maximian (284-305). He served in the Sicilian city of Catania. Always carrying the Gospel with him, Saint Euplus preached constantly to the pagans about Christ. One time, while he read and explained the Gospel to the gathered crowd, they arrested him and took him to the governor of the city, Calvisianus. Saint Euplus confessed himself a Christian and denounced the impiety of idol-worship. For this they sentenced him to torture. They threw the injured saint into prison, where he dwelt at prayer for 7 days. The Lord issued forth a spring of water into the prison to the martyr for the quenching of his thirst. Brought to trial a second time, strengthened and rejoicing, he again confessed his faith in Christ and denounced the torturer for spilling the blood of innocent Christians. The judge commanded to tear off the ears and chop off the head of the saint. When they led the saint to execution, they hung the Gospel on his neck. Having implored time for prayer, the archdeacon began again to read and explain the Gospel to the people. Many of the pagans believed in Christ. The soldiers took hold of the archdeacon and beheaded him with a sword.